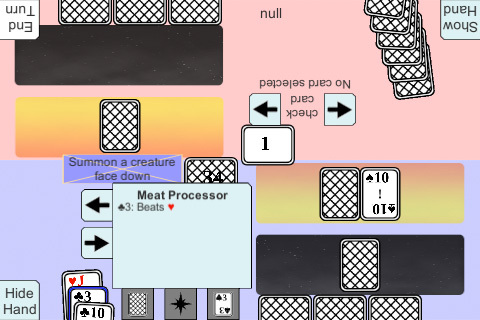 The blinking now disappears after playing a card as shown in the screenshot. It was a lot harder to do than expected though. Now that I think of it, I probably haven’t had to stop something happening repeatedly before. Also, it seems to be buggy in that sometimes the blinking is still there. I’ll have to look further into it. I’ve also added some things to help with testing. The ‘null’ at the top shows the current active card in real time. There will likely be more things shown later. What’s next: Continue investigating the blinking.